When I woke this morning, a beautiful golden sun brightened my world. As I sipped strong coffee with cream after the kids left for school, I made plans for my day. I had some catching up to do after spending the weekend at my parents' house and I started a list of household chores and spring jobs that I wanted to start. When my coffee was gone, I dressed in my usual coveralls and work boots for the usual first of the morning check of the heifers. I have mentioned before the important job of routinely checking heifers. They are all due to calve within 45 days, and we approximately two-thirds of them have already calved. Heifers have never had a calf before and they can have all kinds of problems--but usually have none! They can have a difficult time pushing the calf out into the world; they may give up or think that they have already had their calf after pushing a time and try to steal another cow's calf; they may not know what to do for the calf after it is born, or they may simply lie there after working that hard and rest while the calf struggles for breath. So we check our heifers every 3 to 4 hours during calving season. If they need help, we want to be there to help them and the calf. So every morning, before anything else is done in the day, we check the heifers in the calving pasture to see if any are in labor or if any calved during the last 4 hours in the early morning. This morning, there were no new calves and no heifers in labor, so I headed for the gate looking forward to spending the day on other chores. Then a mama cow caught my eye. She had her head down calling to a calf who was standing in the tall grass. I headed over to see if he was sick or needed a nudge from me, but he looked fine--until he stepped forward, or rather limped forward toward his mama. His back leg was twisted above the foot and obviously broken; he wouldn't put any weight on that leg. This calf is about a week old, and he must have been stepped on by a cow accidentally. I hate seeing a broken leg on a calf. My insides just twist up to see a hurt calf try to limp or struggle to follow it's mama cow like nature tells them to do. They don't know any different, and the cow didn't mean to hurt her baby, but somehow one or two calves a year do get injured. Luckily a broken leg is easily mended and usually heals very well. So I called my husband, who was still home from work, and he caught the cow and calf while I called the vet to make an appointment to have a cast put on his leg. I realized that my spring plans for the day had nearly all been canceled! The cattle come first and nothing stands in the way of making sure that the cattle are healthy and well cared for. I took the little guy (a bull calf) to the vet clinic and our vet set and casted the leg and said that in 4 weeks, he should be good as new! We had a bit of fun, as both the vet and I are big Kansas State University fans and K-state will play their rivals University of Kansas this week, he put a K-state purple cast on the calf's leg! 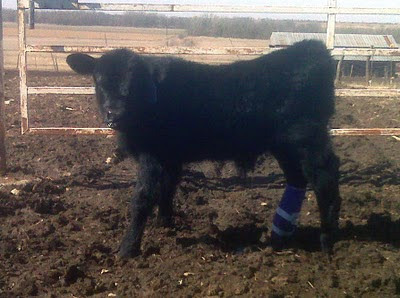 So the calf has a purple cast and a purple ear tag for the occasion and K-state has a new fan! 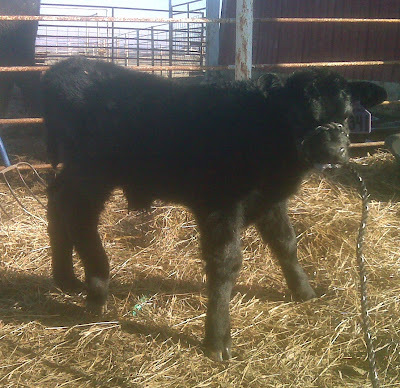 When I brought our little K-state calf back to his mama, she recognized him instantly, but sniffed the leg repeatedly! Finally she licked it once and seemed to approve, as she strolled off, he set off following her--just as nature intended. He still walks with a limp for a bit, but at least he is walking and will be able to keep up with his mama and grow and be happy and healthy in the pasture very soon. We'll cut the cast off in 4 weeks, and it will be hard to tell which calf it was that wore a purple cast! Great story thanks for sharing. You show so much passion for your animals. AWW I feel sorry for the little guy.Good thing he can't tell which color is which or he might "have a cow"! We have a horse that injured his leg badly last fall and had to wear a cast for about eight weeks ... my favorite part was changing the color of his vet wrap! I don't know that he was as amused about it as I was, though. I'm telling you, these are the best bedtime stories. Tonight it was "Mom, if one of our cattle gets a broken leg can it get a purple cast, too?" Great blog Debbi! My city kids will enjoy reading this! Really enjoying your stories! I feel bad for him, but he looks pretty cute in that purple cast! Thank you for reading! If you like this post, I would appreciate any comments and shares. You can see a bit more about me and my family here, and connect with me on facebook and twitter! Please do! Connecting is the WHOLE POINT of blogging! I'd love to hear from you. Supermarket beef is raised by farm families! Copyright 2018. Awesome Inc. theme. Powered by Blogger.